As an HMFWIC of pay per click within some highly competitive markets, you’d think I’d be thrilled about this. You would be mistaken. The screen shot shared by Mashable shows an enormous ad that takes up the entire top of the page. While the search in the example is clearly a branded search for southwest airlines and therefore it only makes sense to give them top billing, there are some definite issues. The user is prompted very strongly to select the paid option. 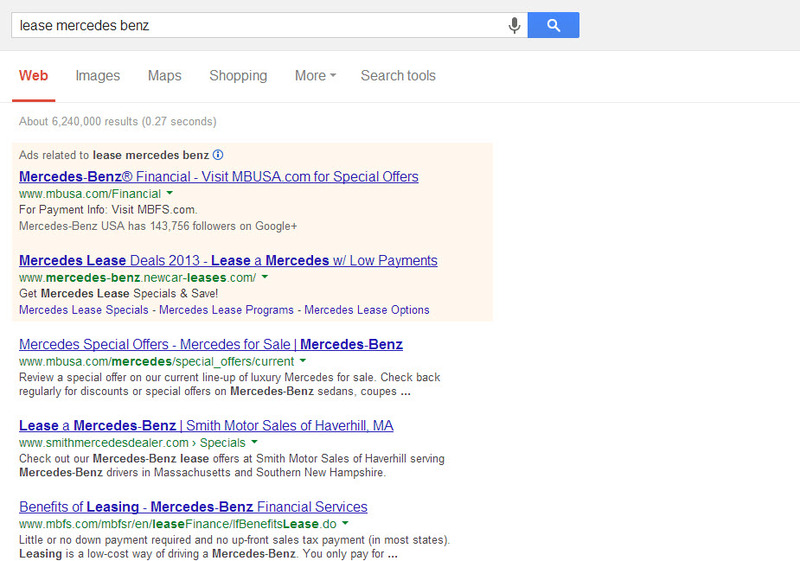 The advertiser is paying for the click on a branded search that they are already naturally number 1 for. This type of advertising puts paid options on very uneven footing with organic results, and with one another. Paid efforts from those with deeper pockets or a bigger taste for risk could quickly outweigh those with fewer resources on less clear-cut searches by dominating the top of the entire SERP. Moreover, it psychologically devalues the organic results by shoving them out of the way. 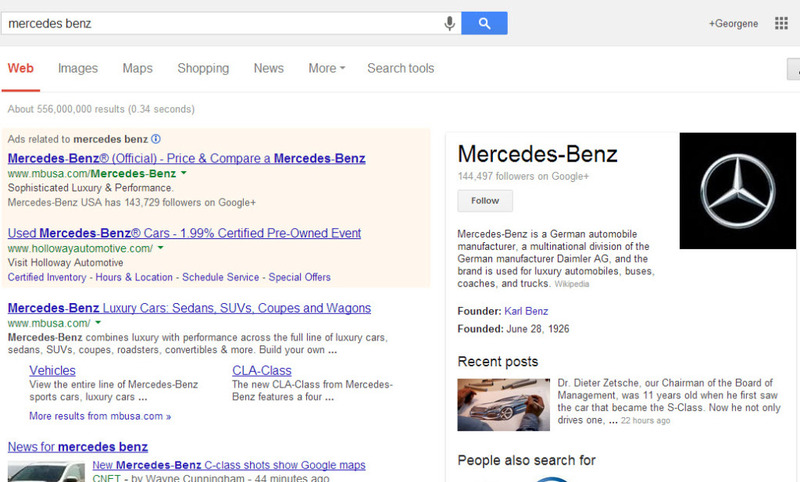 We have trained ourselves around the idea that “first is best” when it comes to search results. The evidence around the benefits for being top billed in Google results is one of the main reasons SEO even exists. If the first – and only, depending on viewport size – thing we see upon performing a search is a significantly large paid effort, that suggests that either the search results themselves are unreliable due to marketing manipulation (Cynic’s Disgust), or that everything else isn’t important compared to this heavily emphasized item (a slightly more natural reaction to emphasis from a reliable source). It creates a larger divide between paid and organic results also by erasing any subtlety currently afforded to paid results by way of their similar-to-organic structure and light background offset. If this were to become a bigger part of paid search, it could well lead to a war of escalation in terms of who can have the largest, flashiest, most “appealing” ad to attempt to drive clicks in the only meaningful place on the page. Imagine this scenario with a less clearly branded term, or a branded term with less blunt intent to search for the brand. Perhaps “Mercedes Benz” versus “Mercedes Benz cars”. Either query could be purely about the brand. Either query could center around an intent to purchase. If a massive brand ad were to dominate the top portion of the SERP, none of the 7 other business advertised or displayed as results would have a shot at first click at all. They are simply out of the running for first-glance choice; forced below the fold by the paid brand effort. For a purchase-based query like “lease mercedes benz”, Mercedes gets the #1 organic spot as well as the #1 paid spot at the moment. If that top-of-page branded ad dominated this query it could push out all dealerships where their product COULD actually be leased. 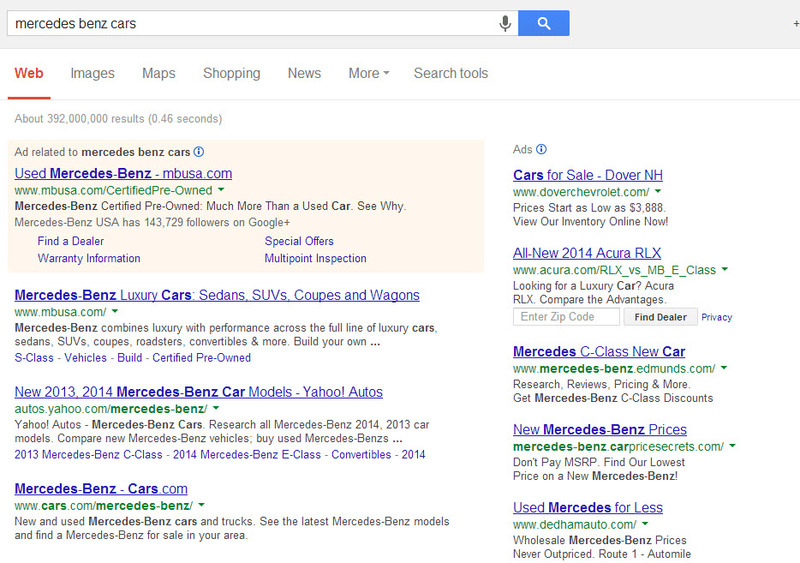 Although there is already a surprising dearth of dealership presence (ads or otherwise) for this query at the moment. The query “purchase mercedes benz” is still heavily in line with the brand, but it has much stronger intent toward an action that probably involves people other than the brand itself. 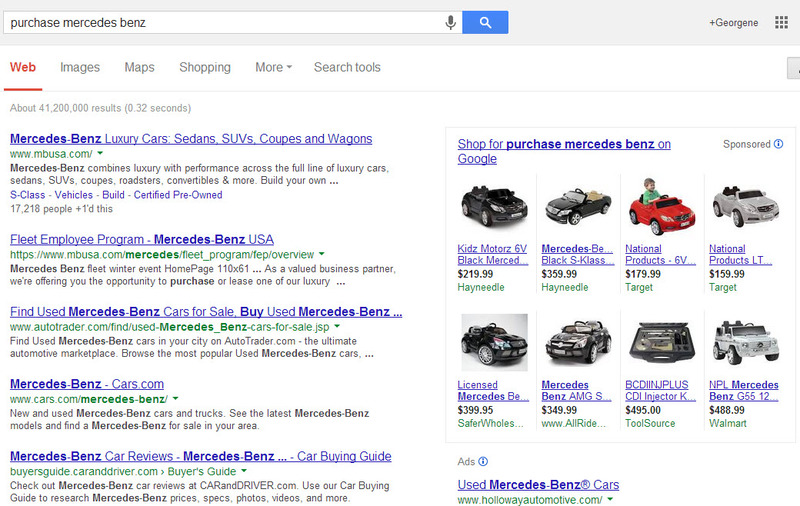 Imagine the search below… but dominated by a large branded effort from Mercedes themselves. How off-putting would that be? Of course at the end of the day this was just one of many, many tests that Adwords performs, and may not ever make it past a blip on the radar. I just hope that’s the case, because I can’t see dominating the search results as shown in that southwest airlines example from the Mashable article as a positive change for advertisers or searchers.